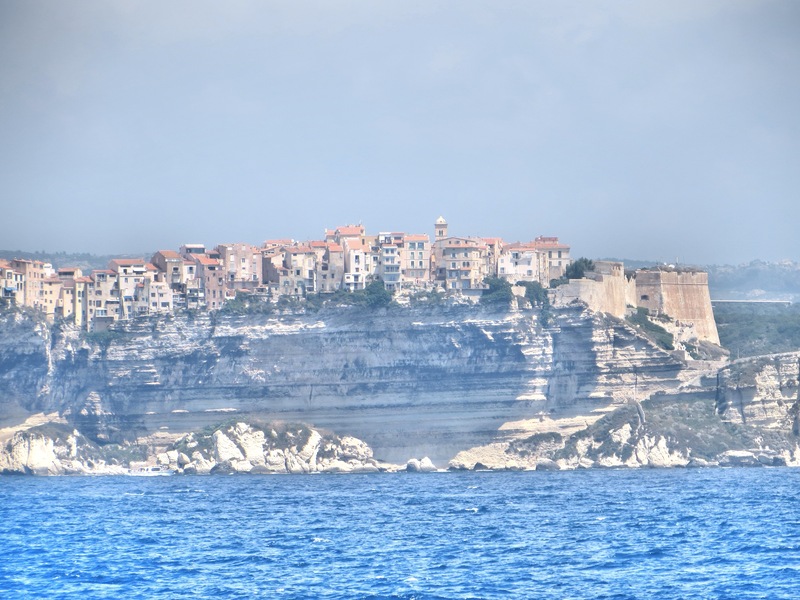 The view of Bonifacio from the sea. Those cliffs are about 230 feet high; you would think the people living in those buildings would be just a little bit nervous. We’ve moved back into France. Bonifacio, a town of about 3,000 at the southern tip of Corsica, is a short ferry boat ride from Sardinia and is in fact the southern-most city in France. As a quick look at a map shows, Corsica is much closer to Italy than France and, in fact, was dominated by Italians for most of recorded history. 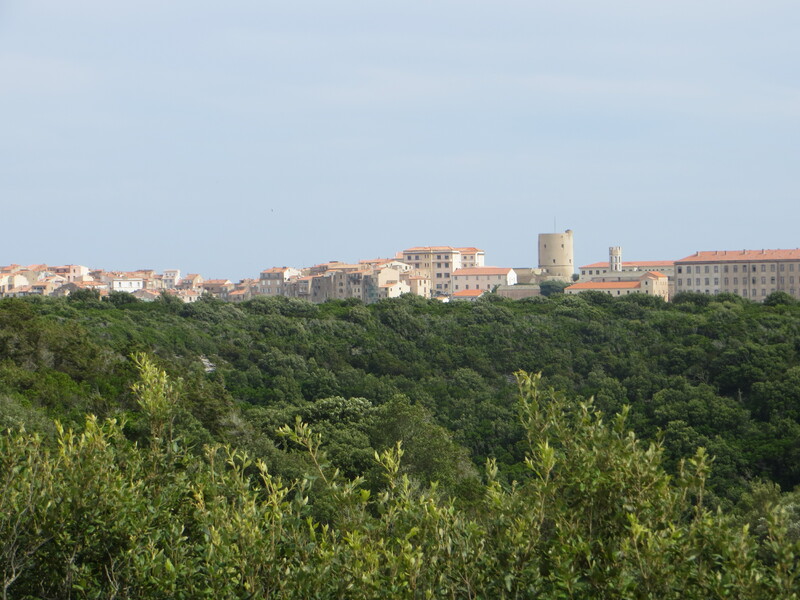 But in the mid-18th century the Genoans (this was before Italian unification) sold Corsica to the French and it’s been French – with a significant Italian influence – ever since. The historic importance of that transaction is enhanced by the fact that Napoleon was a native Corsican, born in Ajenccia just five years after the French moved in. 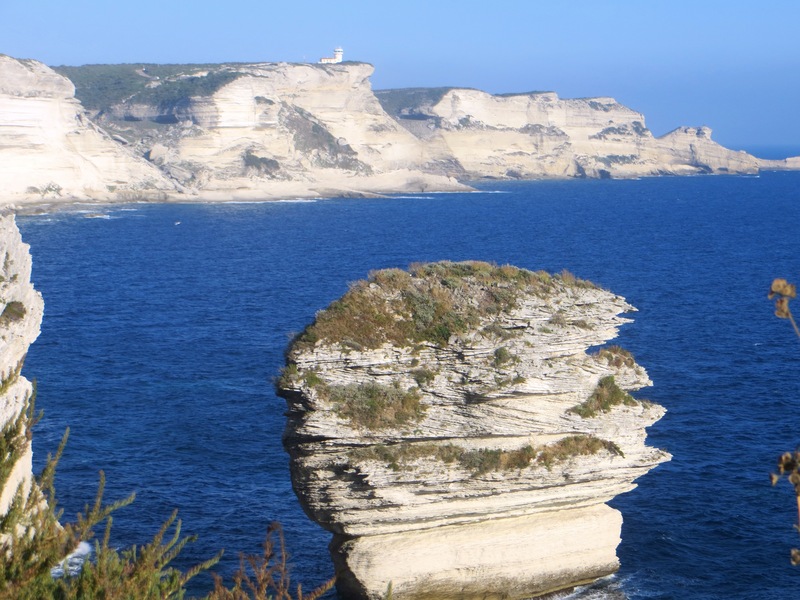 It’s hard to imagine, had Corsica remained Italian, or gained independence as the locals were attempting, that Napoleon would have been as effective in waging war and trying to take over the world. Instead it became part of France, he was born French, and the rest is history. 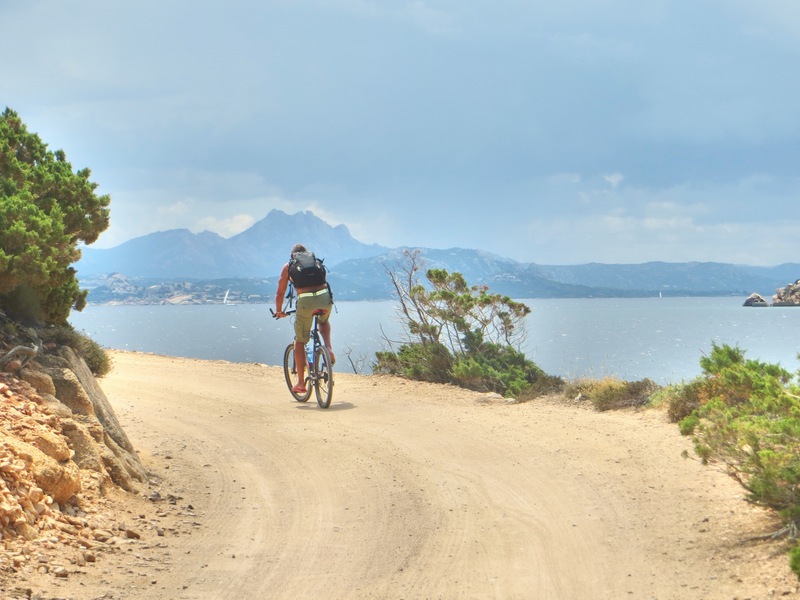 The ride up from Sardinia was exciting, mostly because the approach to Bonifacio is so striking. 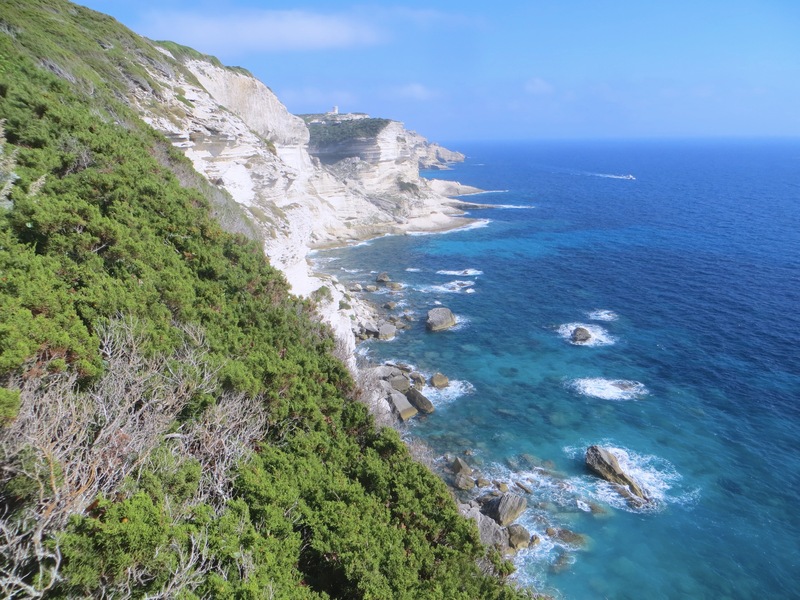 The city is built on the top of white limestone cliffs that rise about 230 feet straight up from the sea, and the views were amazing. Then you come around a corner and see that the city is built on a narrow spit of land making it appear to be a pretty much impregnable location. A good place for a fort, which is what the upper part of the city still is. We only spent a couple days here, but we filled them well. On our first day we rented a scooter to head up the island a bit to a spectacular beach for the day. Then the next day we hiked a couple miles to a very different and more secluded beach; for this, the hike was the primary excitement, better even than the beach. So far, in our brief time back in France, two things stand out. 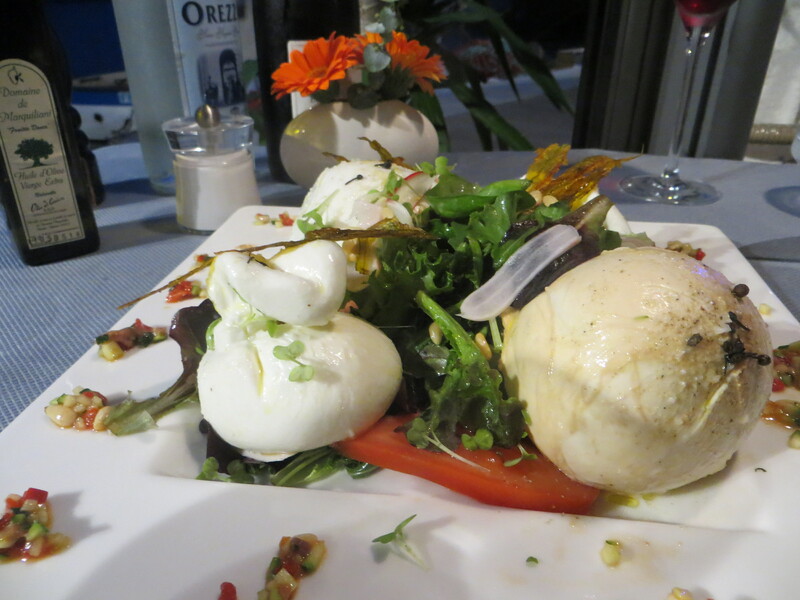 First, it is so much easier to avoid bad carbs (bread, pasta, sugar) in Italy than in France. I know, who’d have thought that the land of pasta and pizza and risotto would be an easy place to avoid those bad-but-good carbs. But, as long as you just skip over the pages on a menu for pasta and pizza, you’re good. And at least in the parts of Italy where we’ve traveled since leaving the States last year, you order a main course and you decide what side dish you want with it. Here in France they’re constantly throwing french fries similar goodies on a plate. Strange. The other difference so far is that public transportation here is a lot more costly and a lot less frequent than what we experienced in Italy. 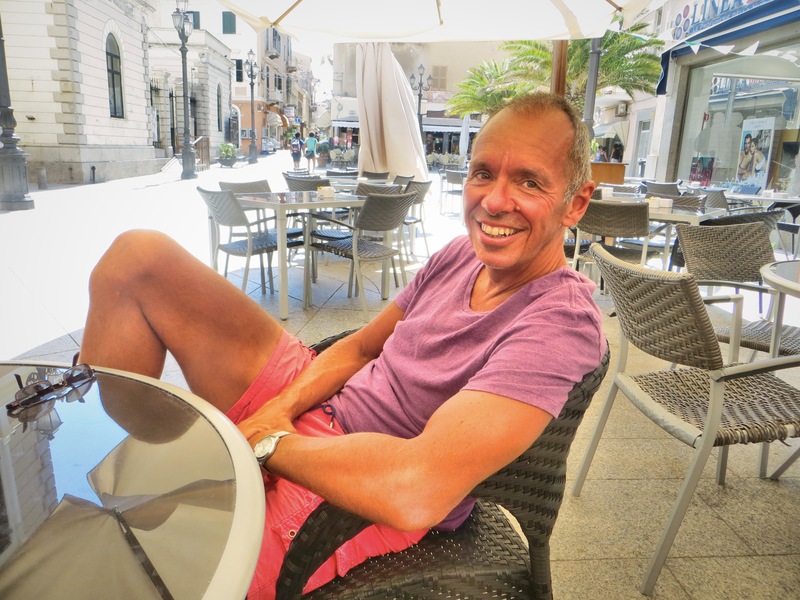 We’ll see how that goes over the next couple of weeks, but whereas in Italy we could always hop buses or trains wherever we wanted to go, it looks as though we may be renting a car to get around for day trips on Corsica. Yikes! 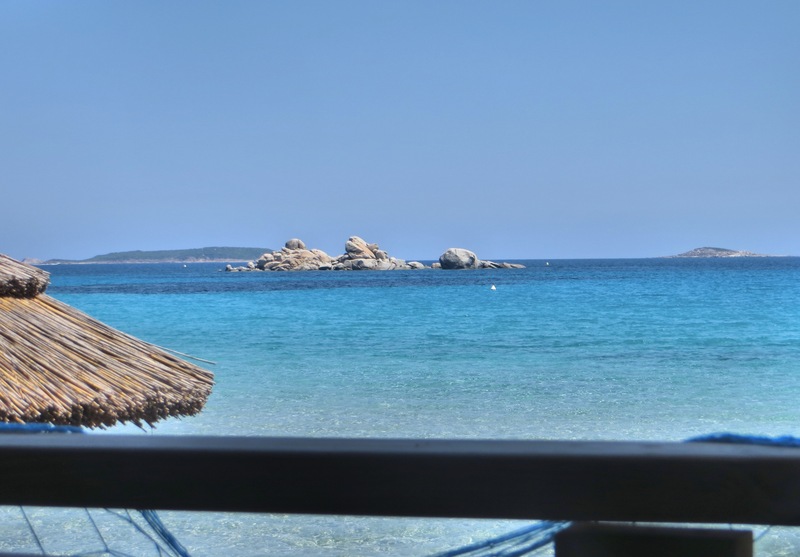 This was our view from lunch on our first day in Corsica. The salads were fresh, the wine was cold, and the view was perfect. Food remains a key component of our travels. This was a (big) sample of four different fresh mozzarellas that we shared. Quite the treat! The view down to the beach. I knew the Mediterranean was beautiful but even I’ve been surprised and just *how* beautiful it is. This is actually from yesterday’s boat trip that Mark wrote about, but I thought we needed one more picture from that incredible day. Don’t you sometimes wonder: “Who are those people who sit in cafés in the middle of the day doing nothing?” Even if they’re on vacation, shouldn’t they be doing something? I’ve wondered that many, many times, but now I’ve learned: they’re ME! Meat, cheese, salad, wine – I like these lazy afternoons! 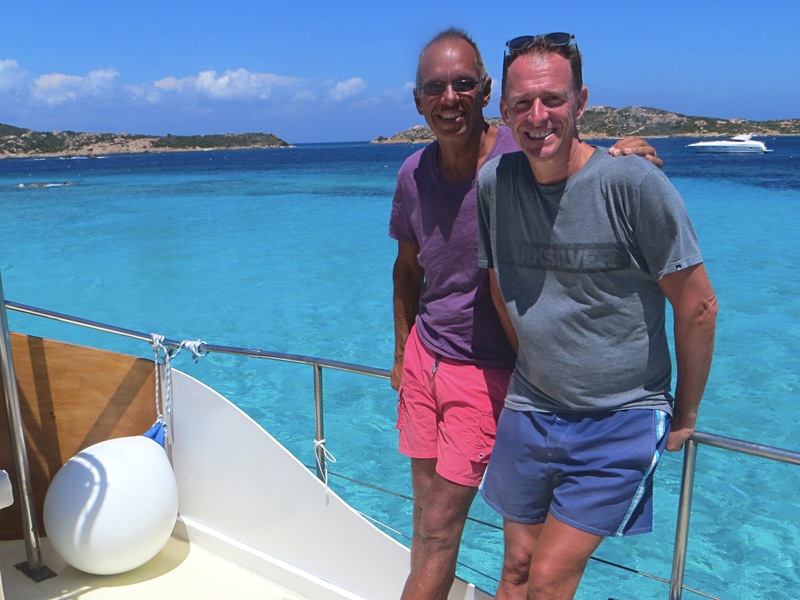 Today’s our last day in Sardinia and – for now at least – our last day in Italy. 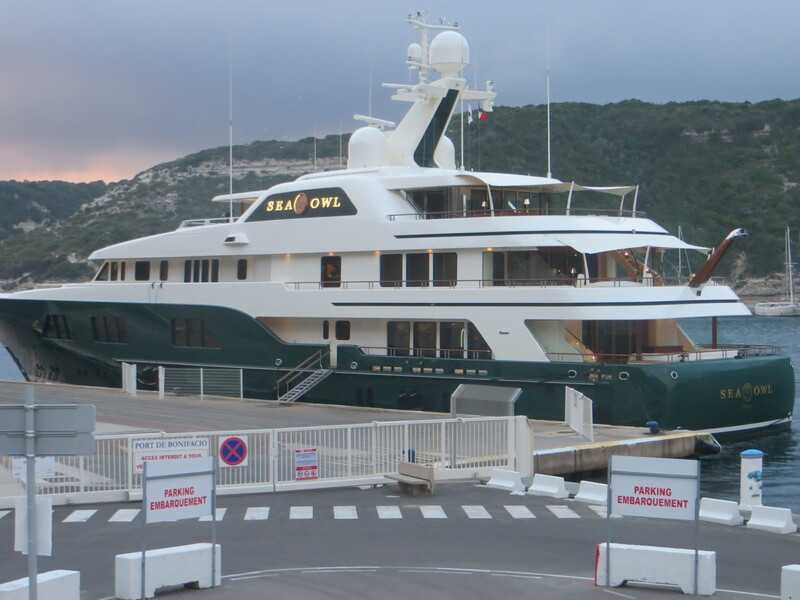 We’re off to Corsica tomorrow, which used to be Italy until the Italians (who weren’t exactly Italians then, but that’s a longer story…ei) needed money and sold it to the French. So now it’s French, except still kind of Italian. We think. We’ll know more tomorrow. 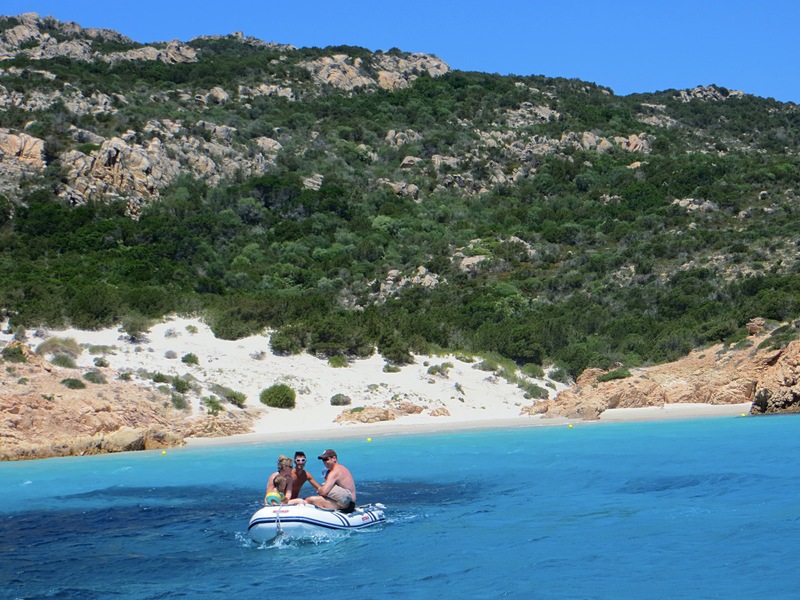 At any rate, for our last day in Sardinia we took a boat to the neighboring island of La Maddalena and then biked to the still-smaller island of Caprera. 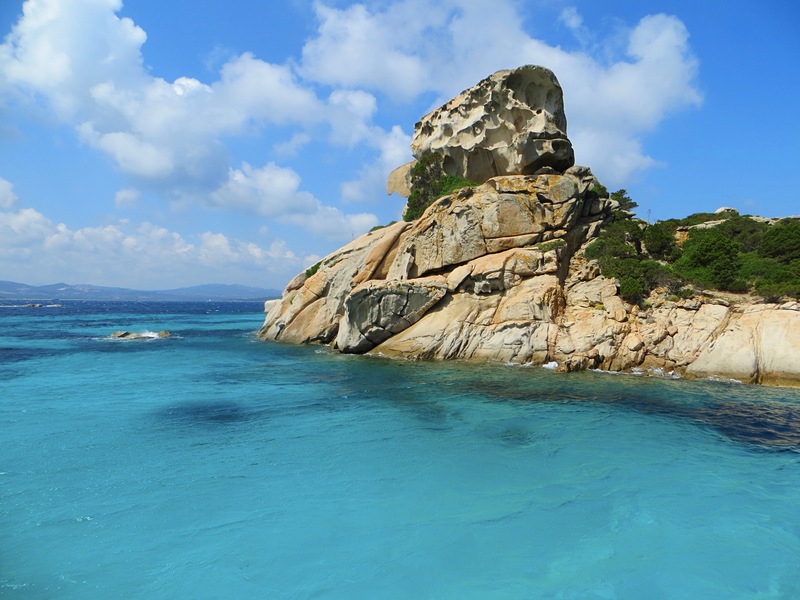 Spent a little time on the beach and then it was back for a long, lazy lunch on La Maddalena. 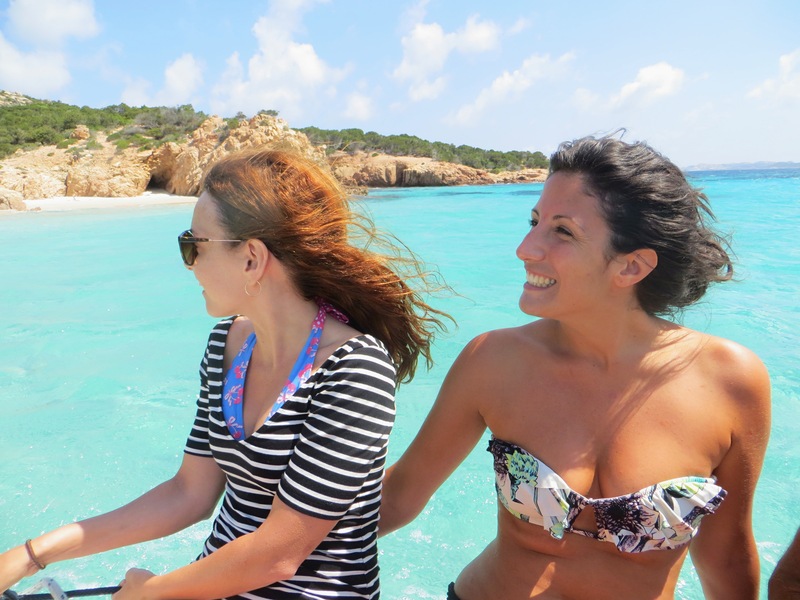 That’s all: boats, biking, and beaching. And cafés. There’s nothing not to like about this life. The beach. I felt like Gulliver with those little people walking all over me! 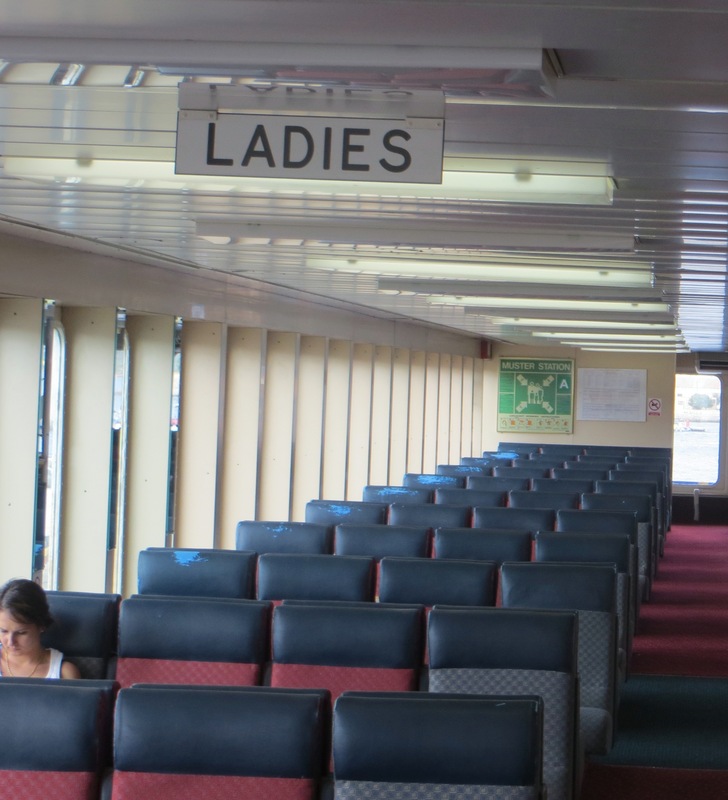 This was totally bizarre – separate Ladies and Gentlemen areas on the ferry boat from La Maddalena to Sardinia. 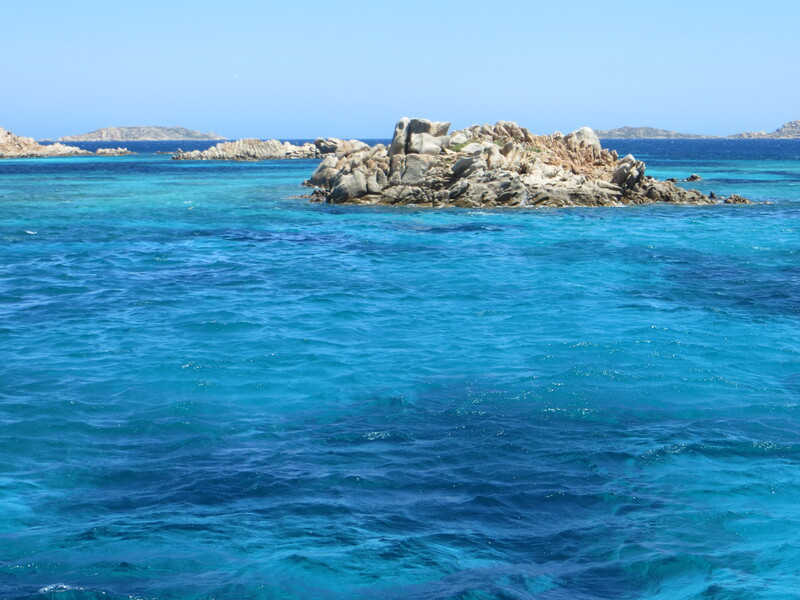 Traveling in the Mediterranean sometimes feels like an endless quest to find the brightest turquoise waters. We’ve come close in Tunisia and Malta. 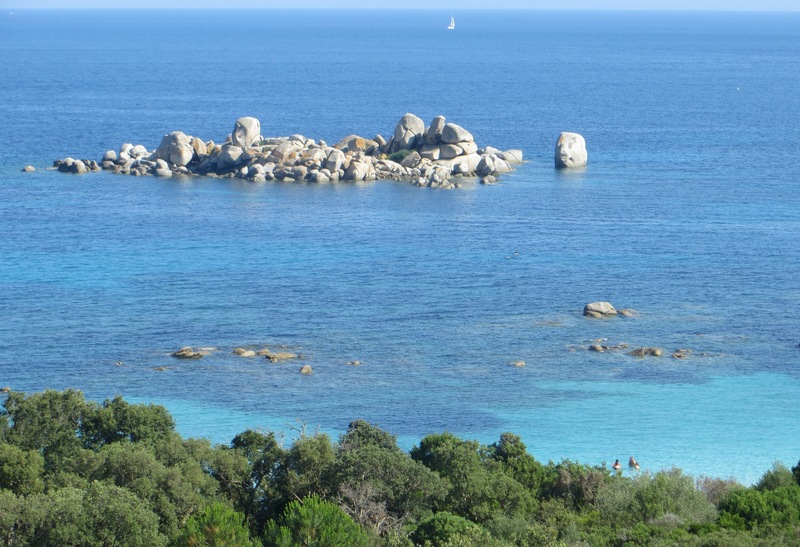 But here along the northern coast of Sardinia we hit the jackpot. From Rome we flew back to Sardinia for three more days here in the north before we take a short boat journey to Corsica. 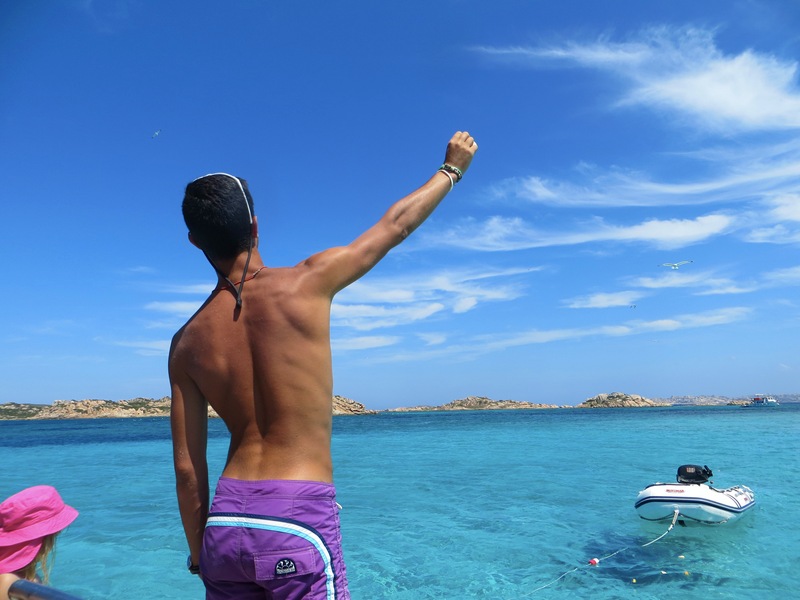 We spent yesterday on the boat Mattia all around the stunning islands and bright blue waters of the Maddalena Archipelago. It really was heaven. When we first arrived in the mainland town of Palau, where we are staying, we checked out the many stalls where people tout their boat tours. They all sounded pretty much the same, including visits to the same beaches and very similar sounding time slots, lunches, activities. 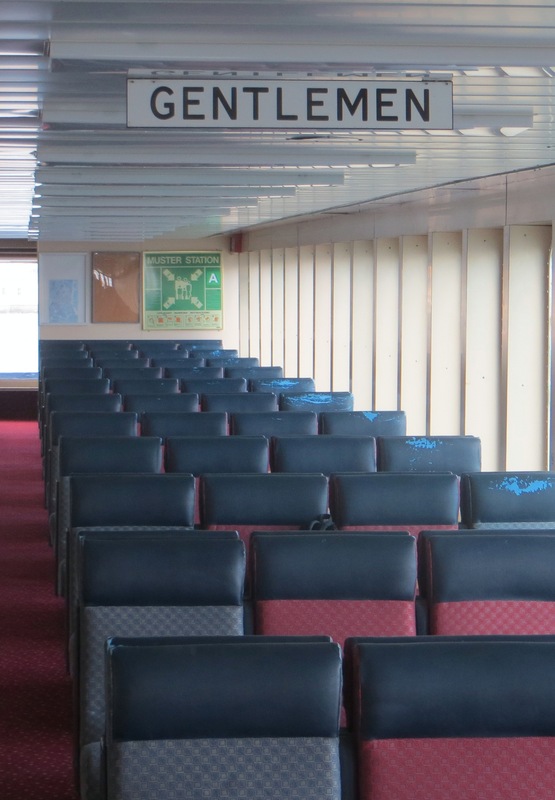 And all sounded like we’d be slightly packed into a fairly impersonal experience. We really wished we could somehow pay more for a smaller and higher quality experience. The more we travel, the more we despise most ‘group encounters’ of almost any kind, and the more we just try to avoid them. 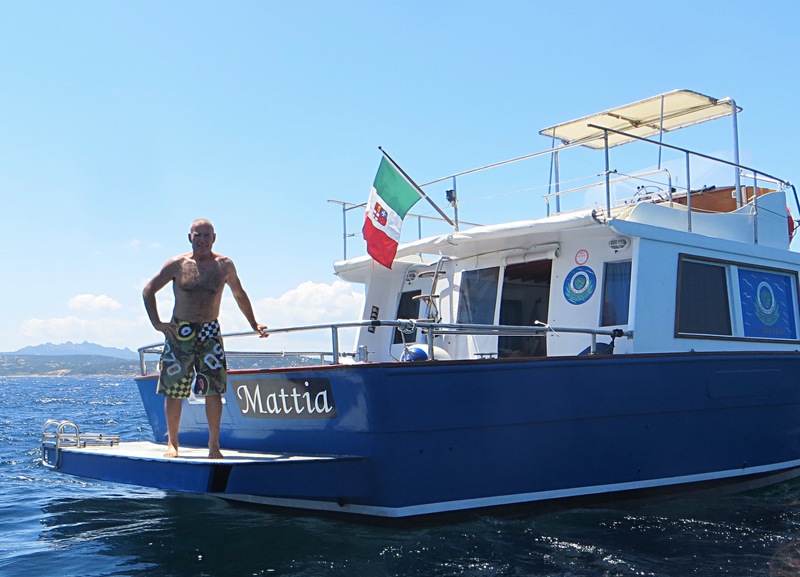 We decided to ask at the hotel desk whether they knew of some better option, and they suggested we talk to Franco, who does especially nice small group tours on his boat Mattia. So I set out and found Franco and set up a tour for the next day. And wow, does our hotel get points for this recommendation! 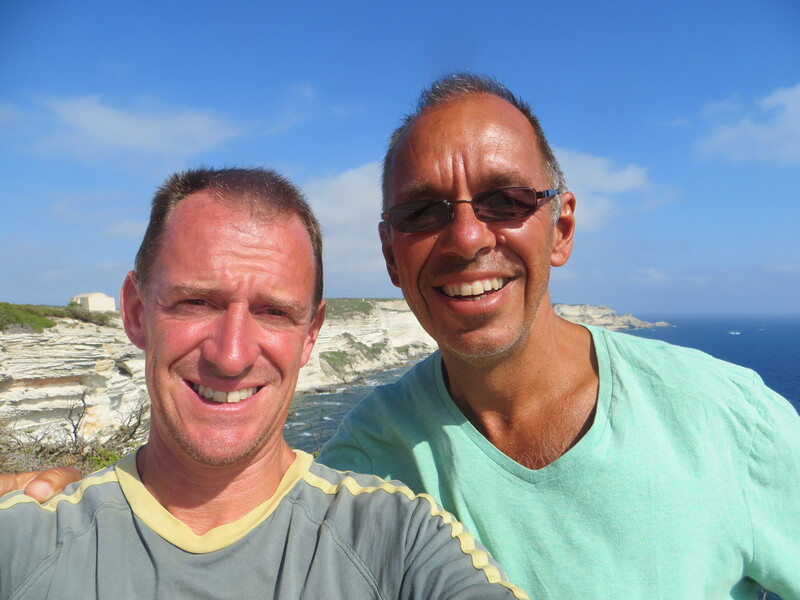 Franco is originally from Monopoli, a town in Apulia that we biked through last fall, and he is really passionate about the natural beauty here in Sardinia. He so relished telling our little group all about the area, the geology that made it happen, and even the celebrities who occupy the spectacular villas. And on top of that he cooked up an incredibly tasty lunch with nice Sardinian white wine. 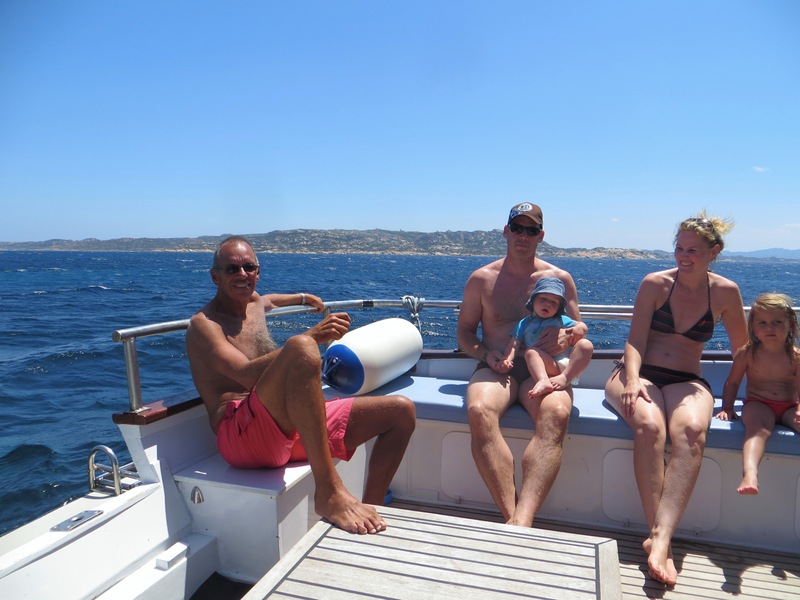 Our friendly little group included two young Parisian women living in Barcelona and a Swiss/German couple and their two young kids. I’m pretty sure we all found the journey incredibly special.